Raumfahrt+Astronomie-Blog von CENAP - Blog: Mars-Chroniken - Blueberries on Mars Have a Watery Past. But Scientists Are Still Baffled. 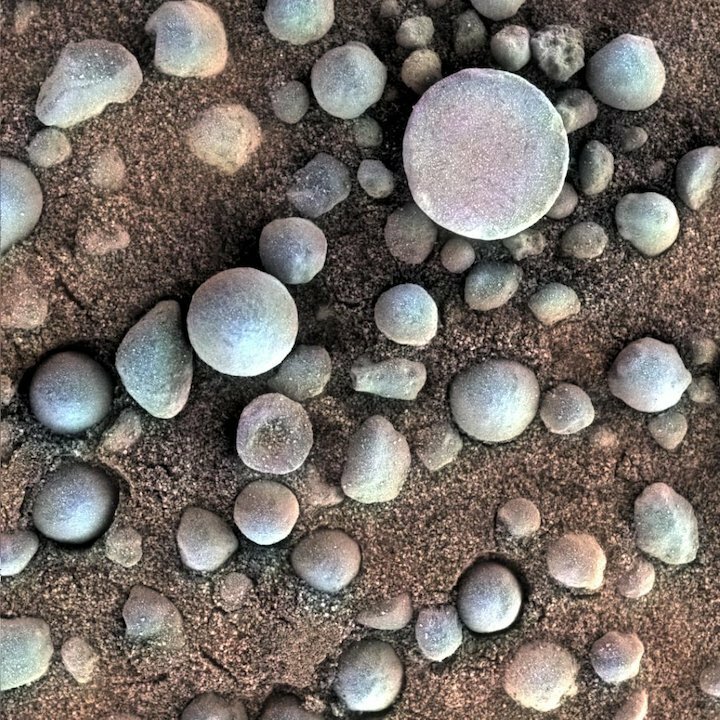 Early in its mission, the Opportunity rover spotted round, iron-rich concretions nicknamed "blueberries," which constituted one of several different types of evidence suggesting that Mars used to be wet. This (false-color) photo captures an area just 1.2 inches (3 centimeters) across. The blueberries are tantalizing for more than just their whimsical name; they also constituted some of the earliest evidence we had that Mars was once incredibly wet. "No matter what the exact chemistry of these spherules was to start, the fact that they're there tells us [that] a lot of liquid water moved through these rocks over time," Briony Horgan, a planetary scientist at Purdue University in Indiana, told Space.com. Mars-Chroniken - 'Blueberries' on Mars Have a Watery Past. But Scientists Are Still Baffled.